What the hell is this? You're usually so much cooler than this. We have such higher expectations of you. Stop turning into us! But seriously, this is the biggest bull I have ever read. This is what drives me up the wall about religion. The hypocrisy. The bible says to hate gays, but you know what else it says? Hmmm... seems like this could be a misunderstanding (every church I've been to has offered warm drinks and food to its regulars, but that's not a "food bank"). It may be that if more people outside the church started using it it'd be classified as a food bank and subject to restrictive regulation. But I will agree that the reaction is totally out of proportion to the situation and that it indeed doesn't seem very Christian. I think my first assumption was that this had to be faked because...dear God how headdesky is that. I've poked around but not sure one way or another but apparently it's based on a story from 2000. Can't find it on the Citizen website though this is supposed to be the church the article is about...don't know the backstory for that though. Still not entirely certain one way or another. Apparently there's talk about it originating on a blog called 'Friendly Athiest' but I've not found the link to that yet either. And found this just now. To be honest, outreach to the poor is a huge program in any church I've been to. Granted, I have a limited experience with churches, but it seems so counterproductive to close down a program that is enriching the community and helping those who need the most help. Isn't that what religion is out to do? Reach out to those in need, those in trouble, and show them the way of spirituality and compassion? In theory, of course. NachtcGleiskette wrote: To be honest, outreach to the poor is a huge program in any church I've been to. Granted, I have a limited experience with churches, but it seems so counterproductive to close down a program that is enriching the community and helping those who need the most help. Isn't that what religion is out to do? Reach out to those in need, those in trouble, and show them the way of spirituality and compassion? In theory, of course. It depends on the size of the church too. For example, my church is big enough to have members deliver food to the homeless about once a month (I forget), but definitely not big enough to run a food bank. We have about 25-35 regular members, I'd say. HoodedMan wrote: It depends on the size of the church too. For example, my church is big enough to have members deliver food to the homeless about once a month (I forget), but definitely not big enough to run a food bank. We have about 25-35 regular members, I'd say. Good point. I admit, it was quite a knee jerk reaction on my part. Just with everything going on, it seemed like "Holy crap, AGAIN?!" There's definitely enough things to headdesk about, that's for certain. What good is done isn't advertised and what bad is done is just so utterly *bad* that you start to wonder if perhaps people are lacing their communion with something because that's the only way a lot of the decisions and stances make sense. Another thing to note is that the Unity Church is not even traditionally Christian, let alone fundamentalist, so assuming they are and throwing Bible verses at them accordingly might not work. In fact, they are waaaay liberal, pantheistic, "everyone is God" sorts without even an official creed. What bugs me about this seems to be the reasons why they're closing down the food bank- not because the homeless are making some people uncomfortable (though a misinterpretation of one of their "gospel of health and wealth" beliefs might fault the poor for not praying hard or positively enough to "mind over matter" themselves into better situations), but because of insurance and such. To me, that's an example of government sticking their noses where they don't belong, when they interfere with a religious group's ability to do good. Angelique wrote: Another thing to note is that the Unity Church is not even traditionally Christian, let alone fundamentalist, so assuming they are and throwing Bible verses at them accordingly might not work. In fact, they are waaaay liberal, pantheistic, "everyone is God" sorts without even an official creed. Haha, that's a good point. I believe my grandmother's in the Unity Church, and even I find their definition of God hard to wrap my head around. Angelique wrote: but because of insurance and such. To me, that's an example of government sticking their noses where they don't belong, when they interfere with a religious group's ability to do good. Agreed, but then I think that about everything. ...look, I'm not ordering them to open it again, alright? I need the food for stocking my Gold Plated Atomic Submarine when WWIV starts. So....yeah. Couldn't agree with this more. 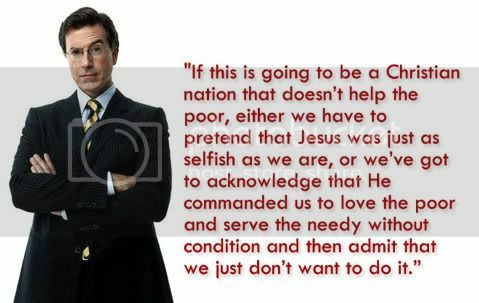 God, I love Stephen Colbert!